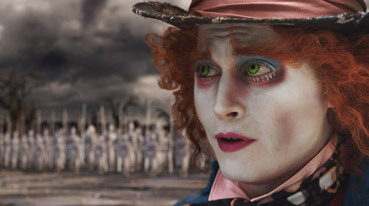 The biggest unexpected surprise of the Tim Burton freshly 'auteured' Alice In Wonderland is the nature of its narrative. It's a second sequel (!) to a print original and its own print sequel. It's twice removed from its source and yet stakes an undeniable claim on the original content of the books that began the cultural juggernaut that is Lewis Carroll's surreal and playful Wonderland adventures. This isn't the place to discuss Lewis Carroll – aka Charles Lutwidge Dodgson, don of mathematics at Oxford – and his dodgy enthusiasm for photographing partially clothed and naked children. In historical context, photography was a very new invention and the children's parents were often present. Let's go with his own reasons for now (aesthetics) and just say one more thing on the matter. There is a superb British film unavailable on DVD Region 2 that covers Carroll's relationship with his subject and how the now elderly 'Alice' – the real Alice Liddell – revisits her relationship with the author featuring Jim Henson's Creature Shop's animatronic characters of Wonderland. Dreamchild, written by Dennis Potter and directed by Gavin Millar, is a superb example of fantasy cinema with an adult theme given a glowing review by the doyenne of film criticism, Pauline Kael back in 1985. Yes, it's a selfish recommendation. It was the first British feature I worked on. So how does the new Alice make Wonderland fresh and seductive? It does so by virtue of Burton's now 19 year-old Alice and her loss of childhood memory. All the familiar characters are forever asking "Are you 'the' Alice?" For aficionados of the originals, this is a little off-putting until you twig (as I did somewhat idiotically) halfway through that of course it's not Carroll's young Alice, it's an older timburtony (and let's not forget screenwriter Linda Woolverton's) Alice. Burton's been oft quoted that any previous cinematic Alices have not been those that satisfied his own take on the world – too twee(dledum) one imagines. Fair enough. This is from a film-maker who re-made Frankenstein in canid-stitchery form (and a bloody great job he did with the 1984 Disney short Frankenweenie at that). So let's take a playful look at Alice's new godfather. Tim Burton is a man with wild hair. He lives in a house next door to his spouse (I am loving the Dr. Seussian potential of this sentence) and cordons off a room to share. That's more than enough of that. Helena Bonham-Carter, his significant other, was hired to play the mega-skulled psychotic Red Queen (and she is wonderful in the role) and when asked why she was cast, Burton replied "Because she's got a big head!" If a personal and professional relationship works as clearly this one does, then it's up to us to sit back and enjoy it. Alice is being groomed to marry a weak chinned idiot at a large garden party. Her father, a dreamer and determined businessman, has recently died and Alice is showing her rebellious side to her mother unaware of the ghastly fate of servitude that awaited any female in the early 1900s. After hesitating over her answer to the proposal, Alice is taken to one side by her prospective mother-in-law (Geraldine James in full on upper class sneer mode) to prepare her for slavery to a man with the allure of a creosote fence. Have a guess what Alice sees streaking through the bushes. And would you like to venture that the little creature is... ahem. Time poor? Alice follows the white rabbit and in the first of a few genuinely creepy/thrilling sequences, she stumbles into a tree hollow and falls and falls... There's never the idea that she will hit the ground eventually like a well-dressed sack of vegetable soup (why is falling so cinematic and yet physics always brushed aside?) Well, this is Alice and we are in fantasy land or even Wonderland so such real world concerns don't bother us at all. Alice finds herself in the room with the small door and drinks a potion and soon shrinks small enough to squeeze through – hullo, turn of the century Pandora, a fantasy milieu created by a mathematician and given extraordinary breadth of life by a man in command of cutting edge CG and a singular imagination that runs through his work like a DNA signature. Almost all the well-known characters are present if not entirely politically correctly. Original illustrator John Tenniel is politely nodded at but this is Burton's Wonderland. And the cast is exemplary and none of the leads but Alice (save for her alarming size changes), The White Queen and the Hatter survive some sort of digital enhancement. Crispin Glover's knave is Crispin Glover put somehow elasticated. He's so close to a real proportioned human being that it's his slight oddness that pulls you up far more than Bonham-Carter's enormous head. The voice talent on offer is also formidable. Alan Rickman's hookah smoking caterpillar is a triumph (and hurrah, no PC re-imagining sans tobacco although it is part of the reason the movie's a PG). Delivering a very distinctive and character-actor turn as the Cheshire Cat is the ubiquitous Stephen Fry. It's here he shows us what a fine actor he occasionally proves he can be. I wouldn't even have considered casting him but Burton's talents extend past the design. Perhaps when I see Stephen Fry, it's very difficult to get the Fry out of the Stephen of Fryness he exudes. Normally this would be a fine thing (as it is in the man's whole persona) but an actor has to convince he's the character and Fry managed to convince me of all people (I'm a fan) that he was a manically grinning, jaunting, Cheshire Cat. Little Britain's Matt Lucas fits both Tweedledee and Tweedledum rather too well. Anne Hathaway's White Queen is a dream – her affectation of high elbowed rotating lower arms and wrists, a cultivated cliché of a virginal princess – is a hoot because she's good enough to play the part knowing that the audience knows how absurd the behaviour is. But most plaudits go to the two principals. Johnny Depp's Mad Hatter steals most of the scenes he's in – nuts is so much fun to play. But Depp delivers more than a little pathos, menace and self sacrifice all while in that ridiculously ostentatious make up and a costume that seems as if it's been grown by a flamenco dancing haberdasher's surly daughter in a shocking mood. His clipped English accent adds to the mix and all power to Burton for maintaining the piece's infused Anglo-centricities, But then Burton is 'one of us' now. So who does he cast in the lead? An Ozzie! The star, anchor, heroine and in almost every scene, Mia Wasikowska is a revelation. Not, you understand, in the sense of shock but she somehow does the enormously difficult job of being utterly believable in the 'real' world, and utterly accepting of the extraordinary invention of her imagination. Yes, she's pretty and it's not exactly difficult keeping your eyes on her but she also has that stillness a lot of great actors have. She does nothing to try and impress anyone and she has no artful method. She is simply a gifted natural and therefore perfect as Alice. The demands of a high budget Disney film weigh a little heavily (Alice becomes an action heroine at the close of play) but it's a small slight in such a visual delight. Ah, yes. The visuals. This brings me back to a subject I've been bleating on about for about six months but I have to bring it up once more. Like James Cameron, Burton has not gone for the 50s 3D temptation of shoving things at you through the screen. I counted about three "Whoah!" moments in Avatar (arrows held in bows that poke out into the audience I recall) but on the whole Cameron used the technique with considerable restraint. The practice of stopping the movie mid flow and thrusting something at the audience is akin to writing emails in capital letters. It's actually now considered stylistically rude to point. That's a good thing. Now it's a safe bet Alice wasn't shot on film (let me check)... Nope. But it is printed on film stock and I noticed a number of scenes that felt as if they could be sharper (as odd as that sounds because high end video is as sharp as it gets. It may have been my eyes or the overwhelming nature of IMAX 3D but there were a few times I thought "Focus! Focus!" In summary, catch it at an IMAX theatre if you can. But you won't be starved of the ability to care if you see it in 2D at your local. And at time of writing that won't be an Odeon cinema. Google that recent piece of Disney business practice if you have a mind to. If you take one thing curiously not from Carroll's originals but Burton's loving update, take this (one of my favourite quotes... and it can't be original as I was certain I'd heard it before). Alice is concerned she might be bonkers because of her over active imagination. Her father reassures her "Yes, you're bonkers! But all the best people are..."